There's an old country and western song that Waylon Jennings sang with the lyrics "she's a good-hearted woman in love with a good timing man." This makes me think of one of my favourite presidential wives, Ellen Herndon Arthur, the wife of Chester Alan Arthur. Like Rachel Jackson and others, Ellen Arthur never got to serve as first lady. She died early in the year that her husband was elected as Vice-President and the year before he would become president, following the death of James Garfield. In the days before the Civil War, Ellen Lewis Herndon Arthur was a beautiful southern belle married to a Yankee (a New York yankee to be precise.) She was born on August 30, 1837 at Culpepper Court House, Virginia in a house built by her father’s brother, Brodie Strachan Herndon. The structure remains standing, and is now known as “the Johnson house.” Her father was William Lewis Herndon, a naval officer who would die in September of 1857 in a shipwreck. Her mother was Frances Elizabeth “Kit” Hansbrough Herndon. Ellen was their only child. She was an Episcopalian. Ellen was of medium height and had brown hair, brown eyes. She attended school in Washington D.C., but there is little documentation about her early years. 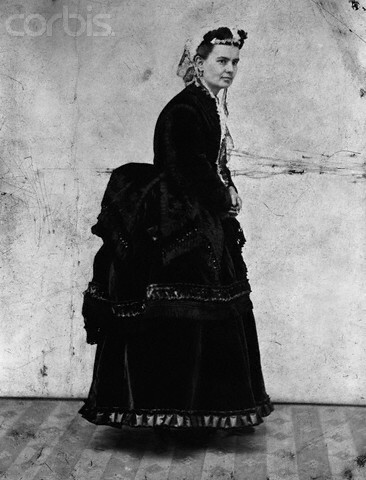 One contemporary called her “one of the best specimens of the Southern woman.” She had an extremely close relationship with her mother, possibly because her father was frequently away at sea. In September 1842, Ellen Herndon and her parents moved to Washington, D.C., due to her father’s appointment to the U.S. Navy Department’s Depot of Instruments and Charts, located at the present-day U. S. Naval Observatory. Ellen Arthur’s most mentioned talent was a beautiful singing voice that was cultivated at a very early age. Her mother was also said to have had a beautiful voice, and singing is likely a passion shared by mother and daughter. As a young girl she was a member of the youth choir of St. John’s Church on Lafayette Square, across from the White House. As a child she came to know Dolley Madison and visited her frequently. The two attended the same church parish. At the time Ellen Herndon was in an age range from five to ten years old, and Dolley Madison, was in an age range from seventy-four to seventy-nine years old. In September of 1847, while her father was on active duty during the Mexican War, Ellen Herndon and her mother left Washington, to live in Fredericksburg, Virginia. In 1851, when he was exploring the Amazon River, Ellen Herndon returned to live in the nation’s capital with her mother until 1855. Maturing into her teenage years during her second residency in Washington, D.C., Ellen was able to take full advantage of the social life afforded by the great wealth of her mother and the prestige of her father’s military status. She was exposed to the city's elite. Her father’s command of a merchant steamship based at the port of New York, had them relocated to that city by 1857, moving into a brownstone they bought at 34 West 21st Street. The heroic circumstances of William Herndon’s 1857 death resulted in a public subscription to raise funds for them. An impressive monument was built to him at Annapolis Naval Academy. The Commonwealth of Virginia ordered that a unique gold medal be struck to memorialize Herndon, and presented to his widow and daughter. Congress and several State legislatures made official resolutions in his honor. Despite the loss of her father, the reality was that most of her life had been spent alone in her mother’s company, William Herndon being a largely absent father. 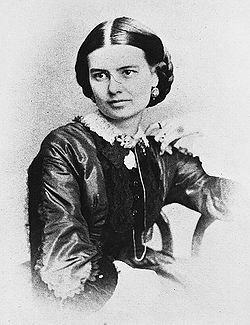 At age 22, Ellen Herndon married 30 year old Chester Alan Arthur on 29 October 1859, at Calvary Protestant Episcopal Church, in New York, New York. Records indicate that the wedding reception in Mrs. Herndon’s home was lavish, the rooms decorated with hanging baskets, vases and table bouquets of flowers, fruit baskets, and thousands of stewed, pickled and raw oysters, lobster and chicken salads, champagnes, brandy, whiskey, sherry, rum and Curacao. The couple would have three children, two sons and one daughter: William Lewis Arthur (December 10, 1860 – July 5, 1863), Chester Alan Arthur, Jr. (July 25, 1864 – July 18, 1937), and Ellen “Nellie” Herndon Arthur [Pinkerton] (November 21, 1871 – September 6, 1915). Chester and Ellen Arthur began their marriage living in her mother’s home. Arthur assumed management of all of his mother-in-law’s investments and real estate holdings. Arthur became a successful attorney. When the Civil War began, Arthur became a member of the New York State Militia with the rank of Brigadier-General, holding the position of Quartermaster-General, responsible for provisioning the soldiers from New York who would go off to fight in the war. He was a friend of Governor Edwin D. Morgan. Arthur earned a large enough salary to afford a luxurious lifestyle that included a three-story Lexington Avenue brownstone with expensive furnishings from Tiffany’s. The couple maintained their status in the elite circles of New York society. As Ellen Arthur’s address book, preserved in the Library of Congress, records, she counted the Vanderbilts, Astors, Roosevelts and other leading New York society families among her friends. Arthur became very active in the New York Republican Party, eventually becoming a supporter and colleague of political boss and later U.S. Senator from New York Senator Roscoe Conkling. Arthur himself did not run for any state or national office before the 1880 election, when he ran as the G.O.P. Vice Presidential candidate. Ellen Arthur’s social network widened her husband’s political contacts. Although Ellen Arthur remained in the Union territory of her New York home throughout the Civil War, she and her mother were conflicted, not so much out of a loyalty to the Confederacy or states’ rights but for the well-being of their relatives fighting for the South. The war was the source of some tension between Arthur and his “little Rebel wife,” as he referred to her during the war. Arthur risked political attack by acquiescing to Ellen Arthur’s insistence that he arrange for her cousin Dabney Herndon (by then a surgeon for the Confederate Army) to twice be released as a prisoner of war from Union prisons, once at Gettysburg. Further, through her husband’s discrete arrangements, Ellen Arthur was permitted to visit her cousin in prison. Arthur had been eager to serve on active duty in the Union Army, but legend claims that he did not because Ellen Arthur could not live with the idea of him potentially killing her kinsman. In 1863, two years before the war ended, he resigned to go into private law practice where he prospered. Regardless of sympathy for her native South, Ellen Arthur accepted the invitations to Abraham Lincoln’s 1865 Inauguration, and the 1874 White House wedding of President Grant’s daughter. In 1871, President Grant appointed her husband as Collector of the Port of New York. There existed for many years a rivalry between Ellen Arthur and Ellen Covert Cornell, the wife of Alonzo B. Cornell, New York Republican Party chairman and Speaker of the New York State Assembly, both ambitious for their husbands’ political success. Ellen Arthur suffered from emotional stresses. In 1863, her first-born child had died before he was even three years old. In April 1878, she was contacted by telegram that her mother, then visiting France, had died suddenly. It required that Ellen Arthur make the trans-Atlantic voyage to accompany the return of her mother's body home for burial. Friends of hers observed that Ellen Arthur’s “shock and nervous tension” in reaction to Mrs. Herndon’s death “did much to impair her health.” A depression resulted from these events, made all the more difficult by the fact that she had to undertake these responsibilities alone. Chester Alan Arthur was focusing on his political career, failing to support his wife in her hour of need. Some years later, it was disclosed by her grandson that Ellen Arthur was on the verge of filing for separation from her husband by the end of 1879. It was said that her “rich contralto voice” had turned Ellen Arthur into a “leading soprano” of the Mendelssohn Glee Club, and that, she was “much in demand,” responding “with grace, to requests, especially when the proceeds were to be devoted to charity.” An amateur group formed in 1866, the group performed in musical competition concerts with other singing groups or at benefit concerts, but also sponsored contests for original compositions, the winning numbers being publicly premiered by the club. The Club had a significant presence in New York’s rich cultural life. On 13 January, 1880 the New York Times reported that Ellen Arthur “is now lying dangerously ill at her home, suffering from an attack of pneumonia of a serious character. The lady was seized with the malady on Saturday last, General Arthur being at the time in Albany, and early on Sunday her illness had assumed such a severe form that he was telegraphed to return to New York at once. He took passage on a milk train, and reached this city late on Sunday night, and has since then been in constant attendance at her bedside. At a late hour last night, Mrs. Arthur was announced to be in a critical condition, and grave fears were entertained that she would not survive the attack.” Later accounts reported that it was after singing in a concert hall, waiting for her carriage while standing on a city sidewalk in a driving rain or snowstorm, that Ellen Arthur developed a chill that quickly became pneumonia. While the article which first reported her illness noted that she was “an amateur vocalist of most extraordinary merit”. Other later accounts claim that Ellen was unconscious by the time Chester Arthur reached her side and unable to recognize or acknowledge him. In fact, he had been in Albany, occupied with the task of helping to engineer the re-election of the controversial political boss and his mentor Roscoe Conkling to the U.S. Senate. At 42 years of age, Ellen Arthur died on January 12, 1880 in New York, New York. Her funeral was held at her parish, the Church of the Heavenly Rest on 5th Avenue in New York. Garfield and Arthur won the election on November 2, 1880, and assumed office on March 4, 1881. Six months later, following the death by assassination of President Garfield, Vice President Arthur assumed the presidency, sworn in at his Lexington Avenue home. Chester Arthur was the fourth U.S. President who entered the White House as a widower, following Jefferson, Jackson and Van Buren. Ellen Arthur’s memory was kept alive by her husband throughout his presidency, in ways both private and public. He paid for the installation of a memorial stained-glass window at St. John’s Church, her childhood parish, which stood directly across Lafayette Square from the White House. With the lights left on inside the church at night, the illuminated stained-glass could be seen from the second floor private residence rooms of the White House. President Arthur moved his own bedroom from the traditional presidential suite on the west end of the house facing the South Lawn, to the suite on the west end facing the church across the square, enabling to see it from his room. Although Arthur had his New York brownstone entirely refurbished in the fall of 1881, he insisted that his late wife’s room be kept just as she left it, like a memorial museum room. Even her bookmark remained where she had last left it, in the last book she was reading, and her sewing needle kept in place on the crewelwork she was doing. Arthur hung Ellen’s portrait on a wall in the private quarters and ordered that newly-cut flowers be placed in front of it on a daily basis. He was even reported to be seen carrying violets because it had been her favorite flower. Bringing a small and beautiful black saddle horse to the White House, he insisted it be the one on which his daughter learned to first ride - because it had been her mother’s. This concludes the potus_geeks series on the First Ladies. I hope you've enjoyed it. Current Music:Sarah Mclachlan-"I Will Remember You"
Thanks much for these, Ken. You did a great job! Interesting to note that the ladies bios were longer and fuller than the men. I'm glad you liked these. I found it interesting how so many of the first ladies were from New York. Curse them beards - especially the kind of hair-drapery worn by Mr. Arthur and others. Conceals all mimic features which might indicate that you have a sensitive human being before you and not an elephant seal. Looking at Mr. Arthur's picture here, you'd never imagine how deep his affection for his spouse was. Other pictures of him make him look much more endearing to me. Also, the kind of skirt worn by Mrs. Arthur does much to spoil the look of a really beautiful woman. I think Arthur loved his wife a lot, but I also think he regretted spending so much time away from her working on his political machine.